Shone Gipson’s experience as an athletic trainer at UH catapulted him to work in the NFL for 16 years and counting. 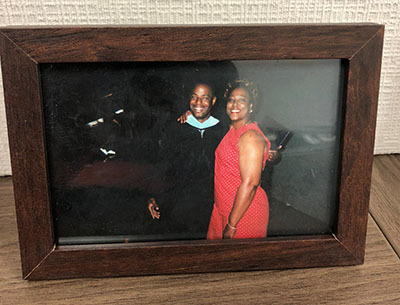 April 3, 2018 – Shone Gipson spends much of his time on the field as an athletic trainer for the Cleveland Browns, but he keeps a special memento on his desk – a framed photo of him and his mom on the day he graduated from the University of Houston 19 years ago. It’s hard to tell who is smiling more, Gipson in his black graduation robe or his mom in a red dress. Gipson, who graduated from the UH College of Education in 1999 with a bachelor’s in kinesiology, recently started the Shone D. Gipson Endowed Scholarship to help future Cougars in need. Gipson keeps a photo on his office desk of him and his mom at his UH graduation in 1999. Gipson grew up 80 miles south of UH in Bay City. He longed to play football in junior high but he had epilepsy and his mom said no. The coach, Dennis Moe, encouraged him to try athletic training. “I went out and loved it,” Gipson said. He continued working as a trainer through high school and then at UH. He found the right major in kinesiology. Joel Bloom, professor emeritus in the College of Education, recalls encouraging Gipson to take his human structure course, which involved hands-on lab experiences with skeletal bones. Gipson remembers long nights in the library at UH. He had received the Barry C. Pelton Scholarship for outstanding work in kinesiology and the Ethnic Minority Scholarship from the Professional Football Athletic Trainers Society. He wanted to keep up his grades. Minoring in education, Gipson interned as a student teacher in a high school health class. He had planned to work as a high school athletic trainer and teacher in Texas forever but decided to try professional sports before graduation. Mike O’Shea, the head athletics trainer at UH, connected Gipson with an internship for the Washington Redskins in the summer of 1998. “Once I got my first NFL experience, I knew that’s where I wanted to work for the rest of my life,” Gipson said. After graduating from UH, Gipson earned a master’s from Stephen F. Austin University in Nacogdoches in 2002. It took him only a couple of years to join the NFL full time. 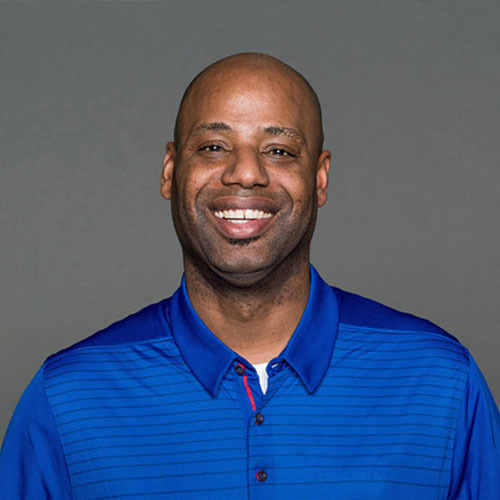 He first returned to UH to work for the athletic department as the director of facilities and operations; interned with the Buffalo Bills; and worked at Texas A&M University. He was hired by the Bills as an assistant athletic trainer in 2004 and promoted to head trainer in 2015. He joined the Cleveland Browns in 2018. During practice and games, Gipson is at work on the sidelines. He and the other trainers monitor players day and night. He may be taping a player’s ankle one minute and rehabilitating a player returning from an ACL injury the next. A good trainer, Gipson said, must have a strong work ethic. “You have to be compassionate. You have to really enjoy people,” Gipson said. O’Shea said he saw that drive and passion in Gipson when they met in 1994. Gipson carried around a textbook on athletic training and read it constantly. Former Buffalo Bills safety Aaron Williams said Gipson stood out among trainers. He recalled Gipson greeting him in the training room after Williams had a helmet-to-helmet collision during a 2016 preseason game. Off the field, he’s excited to meet the first student who will benefit from his endowed scholarship in coming years. The scholarship will be available to College of Education students or those in the Health and Human Performance Department, which houses the kinesiology major.